BYM Welcomes Two New Meetings! Baltimore Yearly Meeting welcomed Monongalia Monthly Meeting and Buckhannon Preparative Meeting under its care at Annual Session this summer. At least seven Friends from the Meetings were present at some or all of Annual Session. These two Meetings were previously members of Lake Erie Yearly Meeting, and the Yearly Meeting is excited to have them join our community. 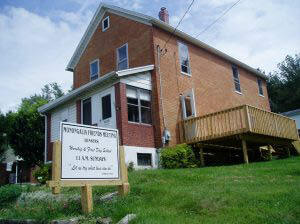 Monongalia Monthly Meeting is located in Morgantown, West Virginia. Like many local Meetings—such as Blacksburg, Charlottesville, State College, and Williamsburg—it’s in a university town, the home of West Virginia University. As well, like several of our Meetings, it’s in the midst of the Appalachian’s beautiful geography and rich culture. The Meeting owns its Meeting House, located in a quiet neighborhood that allows for plenty of light. The Meeting House can even accommodate an overnight stay for visitors! Friends gather weekly on First Day at 11:00 am in silent worship, followed by the sharing of thoughts that have not fully risen to be shared during Worship. Second hour discussions and potlucks are held. In their process of considering joining the Yearly Meeting, they took time to study the Yearly Meeting’s Faith and Practice and other publications. Buckhannon Preparative Meeting meets at the Meditation Chapel at West Virginia Wesleyan College in Buckhannon. Meeting for Worship is held on the second and fourth First Days at 10:00 am. Monongalia and Buckhannon join the growing Shepherdstown Preparative Meeting as Baltimore Yearly Meeting’s presence in West Virginia. Most members and attenders are involved in wider community activities in a number of counties in West Virginia and Southwestern Pennsylvania. They come together as a Meeting to support and nurture one another. Monongalia participates in an annual statewide gathering of West Virginia Meetings from various Yearly Meetings and associations. This year they will be hosting the gathering on October 8 and 9. We thank Monongalia and Buckhannon Friends for being so welcoming and helpful in the process of our getting to know each other. We all look forward to visiting with them more in the future. This past October, we hosted a Fall Gathering of West Virginia Friends. The theme of the meeting was how our Quaker faith and practice informs our response to environmental problems and leads us to solutions. We enjoyed the workshop, presentation, and fellowship of Campbell Plowden (State College), who manages the Center for Amazon Community Ecology. Campbell spoke about his efforts to promote grassroots, ecologically-based development in the Amazon region. A special part of the program was a visit to Arts Monongalia, an art gallery featuring local artists. Friend Ann Payne has organized an exhibit that highlights the problems of environmental degradation in our region. The exhibit, Reflections on Dunkard Creek, features artwork of species killed in the poisoning of nearby Dunkard Creek (PA). In addition our Meeting has formed a listserv available to all West Virginia Quakers, which allows us to communicate with Friends who belong to other Yearly Meetings. We are, for the second year, hosting a series of documentaries for the community that address issues important to us as Friends. It has been heartening for us to be able to provide screenings of these films which would not otherwise be available to Morgantown residents; in addition, the discussion after the films has proven to be rewarding. One of the highlights in the last few months of the Monongalia Meeting and the Buckhannon Meeting was a discussion of the book Right Relationship: Building a Whole Earth Economy by Peter G. Brown, et al. The discussion was very productive, and it was decided to hold further book and article discussions on environmental issues. We aim to continue discernment of our individual and corporate relationship with the earth. In addition, our Meeting plans to contribute to the first of the Unity With Nature Committee's three-part workshop Series in Frostburg this August, regarding our witness of local environmental issues with natural gas hydro-fracking.